Want to improve your vertical jump now? Do these 5 exercises and you will add inches to your vertical in weeks, guaranteed! Follow this vertical jump training program and you will be jumping higher and learning how to dunk before you know it. The Squat is the #1 best exercise to improve vertical jump. No other exercise will target your legs and lower back like a nice deep squat. You need to squat at least 1.5x your bodyweight. This is an absolute minimum. You should really be squatting more in the 2x bodyweight range before moving on to the last 2 exercises. I’m not talking leg press or quarter squats either. I’m talking about nice deep proper squats. This will give you the starting strength needed, not just for vertical jump training, but also to be a solid athlete. Squatting will also help prevent injury when you play basketball and do plyometrics. Squat 3x a week doing 3 sets of 5 reps. Do this until you can squat 1.5-2x your bodyweight with good form. Deadlift will make you super strong. This full body exercise will give you the power and force to jump higher and dunk. The muscles used in the deadlift are hamstrings, glutes, lower back and hips. The muscles used when you vertical jump are hamstrings, quads, glutes, lower back, and hips. This is why deadlift is important for a vertical jump. Deadlift 2-3x a week with 1 set of 5 reps. Work up to 2x bodyweight and you’re body will be ready to jump higher. Throw the weight on your shoulders and jump higher. As with most Olympic lifts, the power clean is all about speed. So is the vertical jump. Jump faster and you will jump higher. Try it. Bend down into a deep squat, pause and jump. Now drop down and jump and fast as you can. Notice the difference? Power clean is widely used in athletic training. You think Olympic weight lifters have 40″+ verticals on accident? How about professional football players? Power clean is one of the core lifts for these sports. Did you know pro football players consistently have higher verticals than pro basketball players? Power clean 2x a week going with 5 sets of 3 reps. Work up to your bodyweight and watch your vertical jump soar. Once you’re squatting 1.5x your bodyweight, you’re ready for the next phase in your vertical jump training. This is plyometrics. Plyometrics require a certain base strength to not get injured. You won’t be jumping very high if you can stand up without pain! A depth jump is where you start on a box or bench or something elevated, step off and jump as high as you can with minimum time on the ground. Start with a 12″ box and do 3 sets of 6 jumps. Make sure you take a few minutes rest in between sets. Even if you’re not tired after you’re done, trust us, stop and rest. You could injure yourself. Do these 2x a week and no more. Work up in height, but please, don’t start higher than 12″. Yep, that’s right. Jumping as high as you can is a great way to improve vertical jump. Go ahead and try to touch the net. If you can do that, try aiming for the rim. Got that? Ok, see if you can dunk a tennis ball. Volleyball? You’re well on your way to dunking a basketball! Nothing helps you learn to jump higher that jumping. Once your vertical jump takes off, dunking a basketball is still not easy. It takes some skill and practice to be able to run up to the basket holding a basketball, jump without dropping it, and getting the ball through the rim. Jump as high as you can 2-3 times a week. Give it 15-20 tries each day and appreciate the results that come with your hard work. Do you struggle with the question, “how do I increase my vertical?” Are you an athlete who wants to maximize his potential? It doesn’t matter if you want to learn how to slam dunk, powerfully spike a volleyball or jump higher than defensive backs to catch a pass, there are a few basic things that you are going to need to know. First, you need to have flexibility. It doesn’t really matter how strong you are or how big your muscles are if you have no flexibility. You won’t be able to increase your vertical without it. Your legs are not the only important areas of your body when it comes to vertical jumping. Flexibility in your hips and back will help you reach your goal and without injury. Second, you need explosiveness. Being explosive is what gets you to your highest high jump. The best way to get this is through practicing jumping. Not just any jumping, but specific jumping exercises such as plyometrics. Thirdly, you need strength. Your muscles need to be strong and powerful to deliver the energy and force that you need. Finally, you need the will power to make it happen. Many people give up on their dream because they think it is too difficult or even impossible. Luckily, it is possible and it’s really not as complicated as some may think. Everyone knows that having a high vertical jump is one of the measures of a successful athlete. It doesn’t matter if you are a basketball forward, football running back or an outfielder in baseball; you need to be able to jump higher than the other guys to be the best. You are not the only one. If you are really serious about improving your vertical jump, you should consider a jumping program. Here are a few tips to consider when choosing a program. A good jumping program should approach training with a multi-faceted approach. 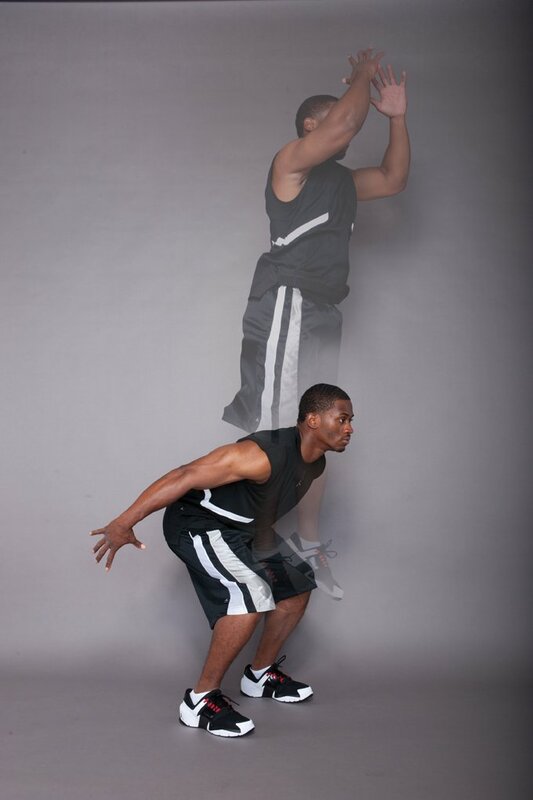 There are more than two or three different aspects of increasing your vertical jump. To get the best results, the jumping program you choose should contain all aspects. These include correcting your form. This alone can add as much as 4 inches. Other aspects include proper training methods and proven exercises to jump higher. Many people do the right exercises, but they do them the wrong way and see very little results. There is also resistance training, plyometric, and flexibility training. Proper nutrition is also important because your muscles need maximum recovery to perform well. Proper nutrition also provides energy which is essential to quickness and explosiveness. It may sound like a lot to take in, but that’s why a personal training coach is so important. With a mentor you can ask questions and get the answers you need to make sure you are doing everything right. A good program will give you personal attention. If the program you choose contains pictures and videos, you will learn the exercises and training techniques more quickly than you would just reading about them. Lastly, you need to learn from an experienced trainer. You don’t want to follow someone who doesn’t really have experience. Make sure the program has testimonials of people who have been successful with it. If you are looking for something that will cause you to jump an extra 10 inches overnight, then you are wasting your time. It will take effort on your part, but I’m sure you already knew that. However, with a good jumping program, you should see results fairly quickly if you put the work into it. After doing much research, I can only recommend Vert Shock jump program that has all the aspects you need to reach your full jumping potential. It’s not magic, but it’s the closest thing you’ll find. This program has everything you need to improve vertical jump in less time than you might think. If you are serious about learning how to jump higher, I highly recommend you check it out. Flexibility is a very important aspect of learning how to jump higher. Without it, you’re just a stiff bunch of muscles. Flexibility will increase your strength and quickness and therefore increase vertical. It allows more powerful and full contractions of muscles providing more explosiveness. More flexibility will also help to keep you from sustaining injuries. There are different ways of stretching your muscles: static and dynamic. Static would include normal stretching exercises by holding a certain position for about 10 seconds. One example would be a hang stretch where you simply cross your feet, bend over as far as you can and hang like a rag doll. Another would be a basic hamstring stretch where you sit with one leg extended and touch the toes of one foot. Dynamic would be actually doing a slow fluid movement such as slowly climbing steep steps to improvement movements in your hips. Another would be walking on your heels. This provides better balance in your lower legs by strengthening your anterior tibialis, which is the opposing muscle to your calf. These two types of stretching, static and dynamic, should be used in combination to achieve maximum benefit. You should do stretches before your strength training to warm up your muscles. You should also flex after your workout to benefit you even more. Your muscles are warm and loose. This is a great time to maximize your flexibility. Plyometrics has become very popular, especially among athletes. It is exercise training that produces fast, powerful movements. It relies on the nervous system, strength and elasticity to improve performance, especially in sports. Its mechanics are quite simple. Quick, precise movements to lengthen and then shorten the muscles are used. An example would be squatting to a sitting position and then with arms raised, jumping quickly into the air as high as you can and then returning to a squat. Plyometrics is also done in sequence using a slower start the first time, holding the pose briefly before jumping. The second time you would jump immediately after the squat. This puts all the stored energy into the jump. Plyometrics doesn’t focus on number of reps, but it is used to produce quickness, so you shouldn’t pace yourself. These types of exercises cause the muscles to become more capable of achieving a forceful, more explosive movement. Using plyometric exercises with your workout routine can significantly increase your vertical jump. Strength training is an important part to increase your vertical. Of course your muscles need to be strong and able to contract quickly. One of the differences in training for quickness and explosion is that you don’t concentrate on the slow steady pace. The weight you use should be enough to load down your muscles and only allow you to do about 8-10 reps. You should always allow 2-3 minutes between sets to recover. Loading down your muscles is what pushes them to become stronger. Don’t do it to the point of injury, but the muscles have to be pushed to grow stronger. Your muscles can actually be trained for quickness by doing power sets, even with weights. For example, when doing calf raises with a sit down calf machine, allow the plate to come down slow and steady. Then push up with the explosion of a jump. Keep the plate resting on the balls of your feet. Another great leg exercise is, you guessed it, squats or leg presses. It is very similar to the calf raises. Using a leg press machine, place as much weight on there as you can stand. Place feet high and away from you. Slowly bring the plate down until your knees are at your chest, then push it away quickly for all you’re worth. Follow same reps as mentioned earlier, remembering to allow for recovery between sets. Do around 5 sets. Many people don’t realize how important recovery is. This is the time when your muscles are allowed to heal and grow. After you have completed your exercise routine, you should allow a day to recover. If you are still sore, you should not exercise that particular area until it has fully recovered. Work on your arms or abs if you want, but give your legs time to fully recover. Don’t forget about a proper diet. Protein and good carbohydrates are a must. Your muscles need fuel to grow and your body needs energy to perform. You may be thinking, “Increasing my vertical may not be as easy as I thought.” Well, nothing worth having is usually easy, right? You can achieve your goal if you work at it. What Are The Best Exercises To Increase Vertical Leap? Can I Really Use Exercises To Increase Vertical Leap? You cannot improve your vertical leap, you are born with hops and there is no way you can change that. If you believed that statement then you are like most people. That statement is false and I am going to prove to you why. Your body is built to jump high. Some people are born with the ability and others have to train it, but everybody has the potential to increase their vertical jump an incredible amount. If you learn how to use exercises to increase your vertical leap you will be jumping over your competition in no time. There is not better exercise than the squat. If you are not doing squats you need to. And by squats I mean full squats, none of those quarter and half squats. The reason you need full squats is because your hips are the most important thing when it comes to jumping high, doing full squats hit your hips better than anything else. Some other exercises to increase vertical leap are the deadlift, power clean, depth jump, and lunges. You want to look for compound exercises, which are exercises that involve more than one muscle group. Stay away from stuff like leg curls, leg extensions, and calf raises. How Can I Use These Exercises To Increase My Vertical Leap? Now that you know what the best exercises to increase your vertical are you are probably wondering how you can use each exercise to its fullest potential. You are probably asking yourself “how many sets should I do?” “How many reps need to be done?” “How many times per week do I workout?” Luckily, the answers are all in the Vert Shock program. It is by far the best program I have ever seen and it will work. To learn more about the Adam Folker Vert Shock, visit official website. 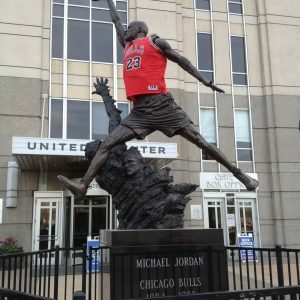 The Slam Dunk…..the most impressive move in basketball. It excites the crowd, pumps up your teammates, demoralizes the opponent and gives you a boost of confidence. Unfortunately, not all of us are capable of throwing down that game changing dunk. Below are tips on how to dunk a basketball like a true pro. Let’s face it, the higher you can jump the easier it is to dunk. Below I have the perfect workout routine to help you gain those inches that you need. Hand Size is Important – Having large hands is a definite advantage when it comes to dunking. Dunking is much easier if you can palm the ball. If you have smaller hands then stick to a two handed dunk. Work On Your Jumping Form – The better your jumping form is the higher you are going to be able to leap. We want to use all the momentum that we have to EXPLODE UP towards the rim. Use The Ball – We want to use ALL the momentum that we can in order to achieve our highest leap. So, use the basketball to create a little more momentum for you. Grasp the ball firmly with both hands, when you are preparing to leap bend your knees and bring the ball between your legs, EXPLODE UP and at the same time raise your arms and bring the ball over your head. This will help you to efficiently use the upward momentum and force that the basketball creates. 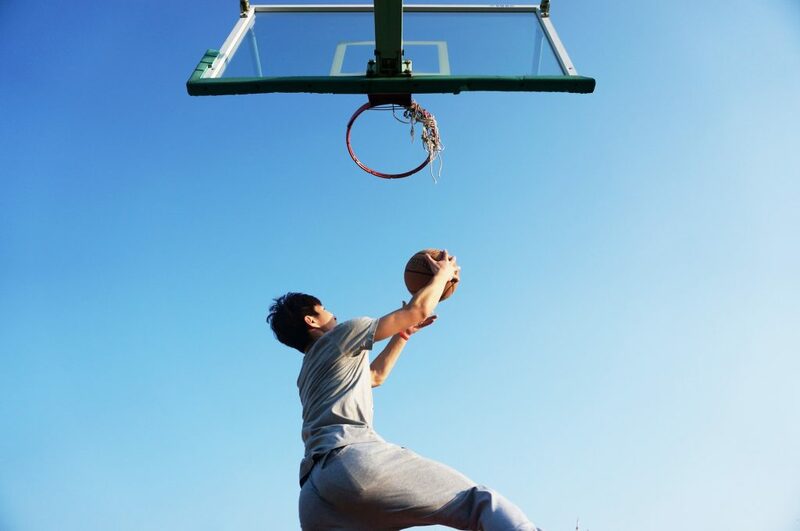 Gauge Your Height – You have to be realistic, in order to dunk a basketball one handed you need to be able to reach at least 6 inches over the rim and 8 inches for a two handed dunk. If you are not able to do this then I recommend working on your vertical leap. Increase Your Vertical Jump by AT LEAST 10″ in 12 Weeks! GUARANTEED!! I gave you a few tips on how to dunk a basketball, but I obviously can’t tell you everything you need to know about increasing your vertical leap on this small website. So, I recommend heading over to Vert Shock and check out the program. If you stick to the workout program and hit it HARD, I guarantee you that you will increase your vertical by AT LEAST 10 inches! 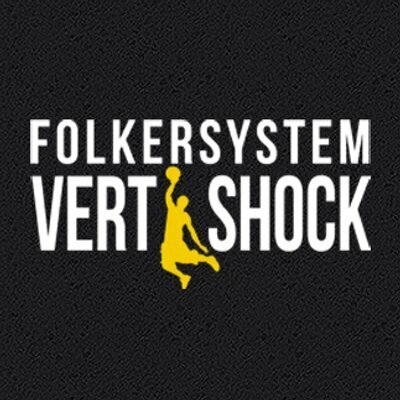 Vert Shock is the best vertical jump training program I have ever come across. It is the only product that effectively targets every aspect of vertical explosion. If you are trying to improve your performance in any sport or activity that requires powerful legs, you will want to do exercises that build strength and explosive power. Exercises that help improve your vertical jump will absolutely help. Hopefully you will obtain some info here to help get you started at improving your vertical jumping power by increasing your leg strength. Be ready to work hard to get those extra inches you need. It is not easy trying to get strong enough to increase your jump height and it will have to be a long term pursuit so don’t give up. So you think you are too short to dunk? When you have the desire to have the ability to have explosive jumping power as needed for Basketball or Volleyball or even for Football, Running or other sports, you should follow a comprehensive plan to reach your goals. Using the so called shotgun effect of just trying different things will not give you the best results. The purpose of this site is to concentrate on improving the ability to jump higher. The exercises and methods shown here are to illustrate some of the things that you should be expected to do to improve leg power to give you those extra inches. To achieve this goal you need to first start doing slower, controlled exercises like SQUATS and LUNGES to build the basic power and strength in your legs, and you must do exercises that are explosive like PLYOMETRICS. Remember to do these two types of exercises on separate days. In addition to these, work on your core strength and your upper body. If your body weight is more than it should be, you need to get it down. Trim off some fat and you have less to get off the ground. If you are not used to doing intense workouts, take it easy at first till you get stronger, don’t overdo it. And, you must take time to recover from your intense workouts, you will not get stronger if you do not give your muscles time to repair and grow. Four days a week should be enough to improve your jump. And allow up to six months to see real results, this is not an overnight success story. The first thing you must do is to work on basic leg strength, strong legs are the key to greater jumping heights. Exercises such as squats and deadlifts are the most important. Hamstring curls, lunges and other such exercises would be next. Remember that a good portion of the power needed to jump come from the hamstrings and glutes. While you need to work on the entire leg, concentrate a bit more on those two areas. Do not even try to do plyometrics until you have a good foundation of strength. 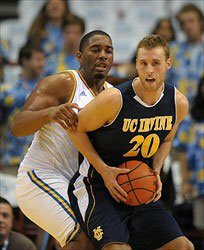 A lot of what is found on this site relates to improving jump skills for Basketball or Volleyball. 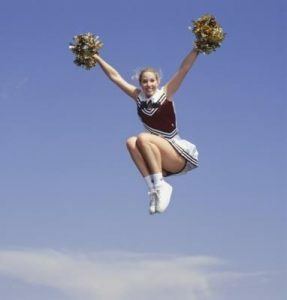 But those who participate in Cheerleading need to be able to jump higher also. Cheerleaders could benefit from stronger thigh muscles but not to the extent of doing heavy squats. There are a number of good exercises that Cheerleaders would benefit from to improve the leg strength. Cheerleaders should also improve their core strength as a stronger mid-section helps to support your torso. When I say core strength, I’m not talking about just doing ab workouts. Core Strength means the different muscles that help control the spine, pelvis, back and abdominals. In other words, the Torso. The benefits of core conditioning are better body control, improved balance, reduced risk of injury and increased power. Hip Raises: While on your back, legs bent upward 90 degrees, raise your hips upward and lower them. Russion Twists: While sitting with knees bent, twist your torso slowly side to side. You can hold a weight for extra resistance as needed. Prone Bridge: While laying face down, Balance on your toes and forearms while keeping the back straight. Hold for count. Side Bridge: Like Prone Bridge, only you are on your side balanced on forearm and keeping body straight. Hold for count. Alternate sides. There are many more exercises that can be used. Mix them up so you keep the muscles from getting used to the same stuff. These are for after you have built your foundation of strength! Jump workouts or plyometrics will stimulate the explosive power of your muscles. You need to move into this training with caution at first until your joints are used to the extra impact they will receive. The quality of your jumps not the quantity will take you further and help prevent injury. Remember to be warmed up prior to doing plyometrics. Depth Jump: Step off box and land on both feet and go into shallow squat then jump up. Foot contact after jump should be minimal. Hops: Just jump forward over and over. Start at short distance and increase when stronger. Box Jump: Jump onto a box for repetitions. Increase the height as you get stronger. Vertical Jump: For this one, squat down as if to jump. Hold this position for five seconds then explode upwards into a jump. Ankle Hops: Hop just using the motion of your ankles. Box jumping, or jumping up on any platform you can find is a great way to build explosive power in your legs. Just stand with feet shoulder width apart, lower yourself by bending your knees and drive yourself upward onto the box. Step back down off the box and repeat the jump. Keep your torso straight and your head up and be sure to use your arms to help propel you upward. As you get stronger go for higher jumps so you keep pushing yourself. What’s good about doing box jumps is you get the benefit of the explosive jump without the stress on the body impacting the ground. To give extra variety to the workouts try jumping rope, this will give cardiovascular conditioning along with a leg workout. When your legs get stronger, you can hold Dumbbells for extra weight for resistance for some of your exercises. There are specialized shoes available that force you to stay on your toes to strengthen your lower legs. And finally, you need to work on jumping technique to help get you off the ground. With a little research you can find the info you need to succeed at jumping higher. Remember it will take time so do not give up or be discouraged at achieving your goal. Put together a routine that will utilize the three parts (core, leg strength and explosive power) that will be compatible for you and give it time to work. Vert Shock is the program I recommend on this website. Check out my detailed Vert Shock review here.